The Grumman S-2 Tracker is a four-seat; twin-engined; anti-submarine warfare aircraft. Designed and initially built by Grumman, the Tracker was of conventional design; propeller-driven with twin radial engines, a high wing that could be folded for storage on aircraft carriers, and tricycle undercarriage. The Tracker flew first in prototype form on 4 December 1952. Grumman built 1,185 Trackers. About 100 CS2F aircraft were built under license by de Havilland Canada in Canada. The Royal Dutch Navy / MLD received 28 S-2A (S2F-1) aircraft under MDAP from US Navy in 1960, and 17 additional CS2A Tracker anti-submarine aircraft formerly operated by the Royal Canadian Navy. The Canadian aircraft were delivered between December 1960 and September 1961 after being overhauled by Fairey Canada. The aircraft were operated from Valkenburg Naval Air Base as well as from the light aircraft carrier Karel Doorman until a fire in 1968 took that ship out of Dutch service. A total of 18 aircraft were converted to S-2N (for Netherlands) standard by Fairey Canada in 1968–1970 for ASW and MR use with 1 Sqn (at Hato International Airport), of which four were converted to US-2N trainer/transport standards in May 1971. Most of the de Havilland Canada-built CS-2As were scrapped by 1970 or used for ground instruction. The last Tracker in MLD service was withdrawn in January 1976, with some transferred to the Turkish Navy. On 5 September 2003, Grumman US-2N Tracker 159'V' was seen at Aviodrome at Lelystad Airport in the Netherlands. The Grumman US-2N Tracker c/n 720 ex BuAer 148281 was original delivered to the Royal Dutch Navy / MLD as a Grumman S-2N. In 1972, the "159" was converted to the US-2N model and used as target tug. 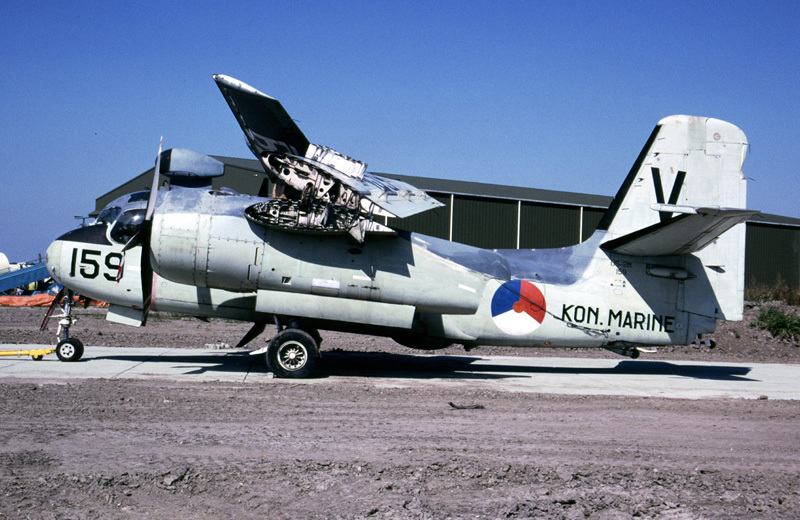 After being withdrawn from use at Den Helder-De Kooy on 1 October 1975, the Grumman Tracker was transferred to the aviation museum Aviodome at Amsterdam Airport Schiphol. In 2003, the Aviodome moved to Lelystad Airport and was renamed Aviodrome.